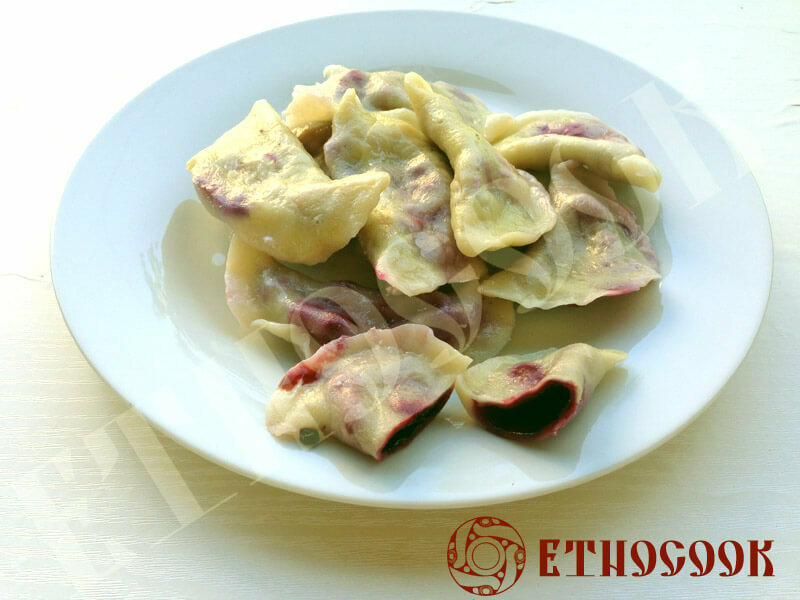 Varenyky, Ukrainian Dumplings with filling are known since ancient times and are very special among the most popular Slavic dishes. In the ethnic Ukrainian cuisine Varenyky were well known as the most popular dishes in Kyiv Rus (Kievan Rus’) together with Ukrainian Borshch and Pampushky. 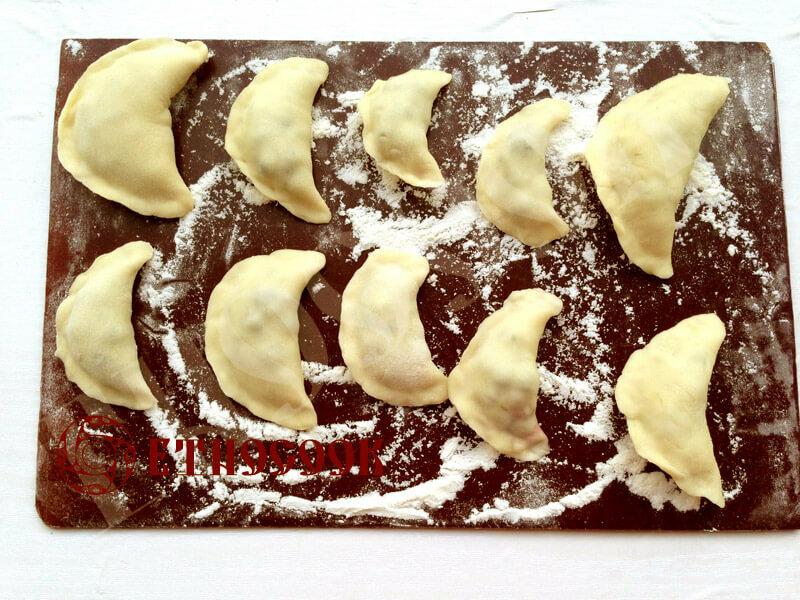 The best easy and perfect recipe of Ukrainian dumplings Varenyky (also known as pierogi, pirogi, pirohy, pyroh) from Etnocook has a lot of tips and useful pieces of advice. 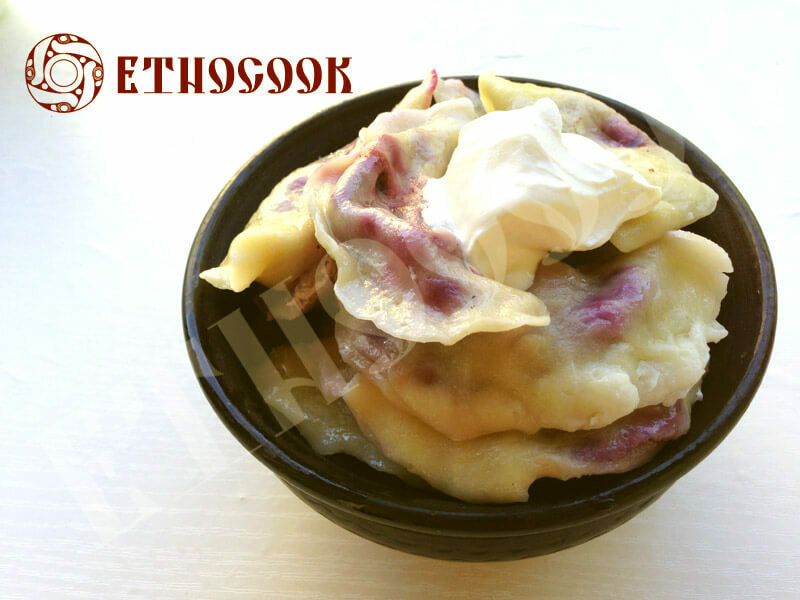 The traditional Ukrainian dish Dumplings with bilberry filling (Varenyky z chornytsiamy, ukr.) is made by wrapping unleavened dough around a berries filling and cooked in boiling water. It is very special, as bilberries are well known medicinal plants. Bilberry is used for centuries by Ukrainians to improve eyesight, treat different eye conditions (for example cataracts and disorders of the retina), atherosclerosis, varicose veins, chronic fatigue syndrome (CFS), hemorrhoids, diabetes, osteoarthritis, gout, skin infections, gastrointestinal (GI) disorders, kidney disease, and urinary tract infections (UTIs) and improve diarrhea. The word “Pyrogy” is the ancient Slavonic word “pirog'” that is – formed from the word “pir'” (“feast”) with the suffix -og’ or from the word “руго” (“wheat”), the ancient slavic word “pyro” under the influence of the word “pir'” (“feast”). The word “Varenyky” is from the word “varyty” (“to boil”). 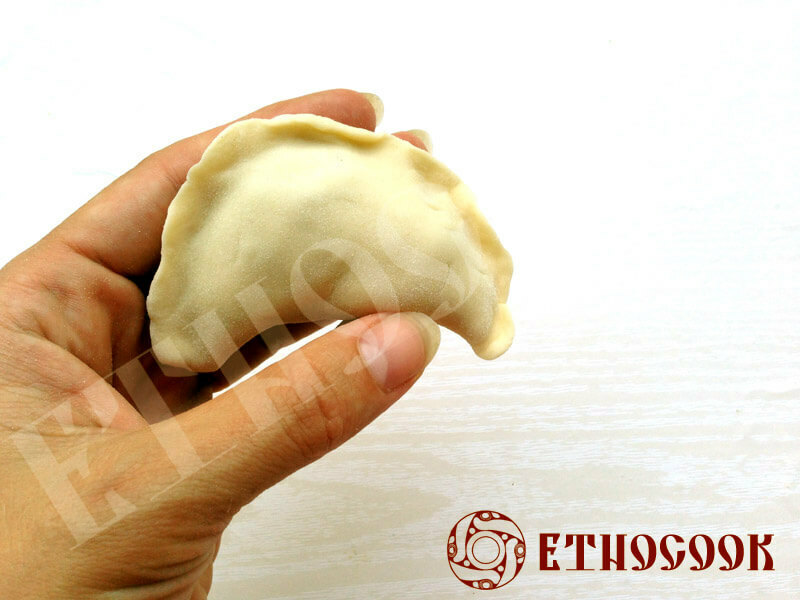 The dumpling (varenyk) itself in Ukrainian traditions is a symbol of women’s power, childbirth. In Ukraine was a tradition that the first dish in ancient times that mother ate after childbirth was Varenyky and people who cooked them wished her to have a lot of children and said “Be always full like varenyk”. 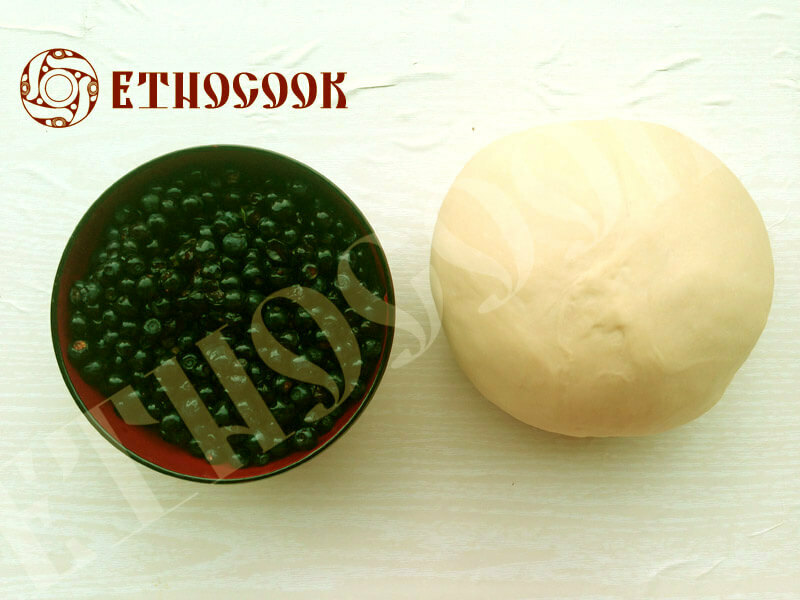 Prepare all ingredients for the Ukrainian traditional dish Varenyky (Pyrohy) with bilberry filling (chornytsi, ukr.). Make sure there is everything needed for dough and filling from the product list. Wash berries for filling properly with cold water and take off all little leaves. In warm water (2 tablespoons) mix salt and sugar (for dough). Sift flour, add cold water (1 glass, 200-250 ml), add water with salt and sugar, melted butter (can be replaced with vegetable oil). Mix well, if necessary, adding more flour until the dough becomes elastic and doesn't stick to your hands. Etnocook recommend to cover it with linen cloth and give some rest, for half an hour. Then roll using a rolling pin or a pasta roller a thin dough (1-2 mm), use some extra flour or starch if the dough sticks. From the rolled dough make rounds with the help of a special form for dumplings or a glass. Put the filling by a small spoon in the middle of the rounds and press the edges. Don't take much filling. 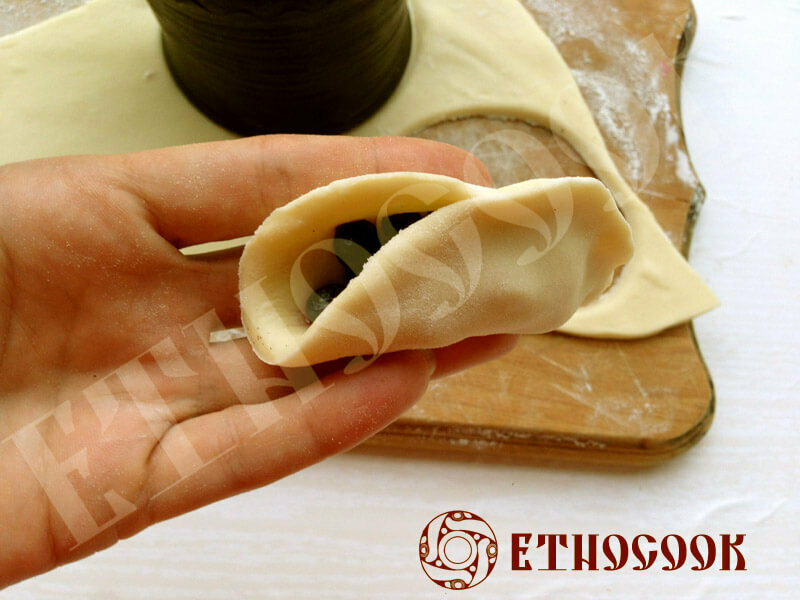 Etnocook recommends to put a little of water around the edge inside of the dumpling and then press, it will more likely stay closed. Varenyk (pyrih) has the form of a crescent. Dumplings Varenyky are boiled in small portions (10-15 dumplings) in a big amount of hot slightly salted water (1 tbsp. of salt for 3 l of water). When the water is boiling, reduce the heat to low, put varenyky, boil for 1-2 minutes, and remove with a slotted spoon into a deep bowl, add butter or oil and mix. 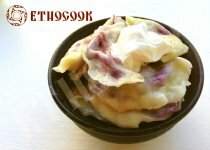 Serve Ukrainian Varenyky (Pyrohy) warm, add honey, butter, yoghurt or sour cream to taste.